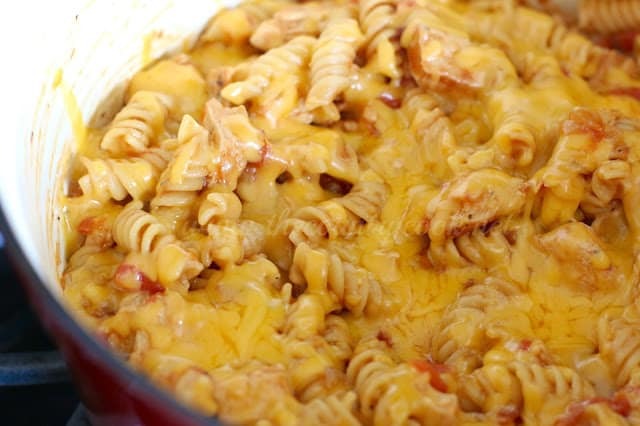 If you could capture a spring or summer cookout in a pasta meal, this right here would be it. 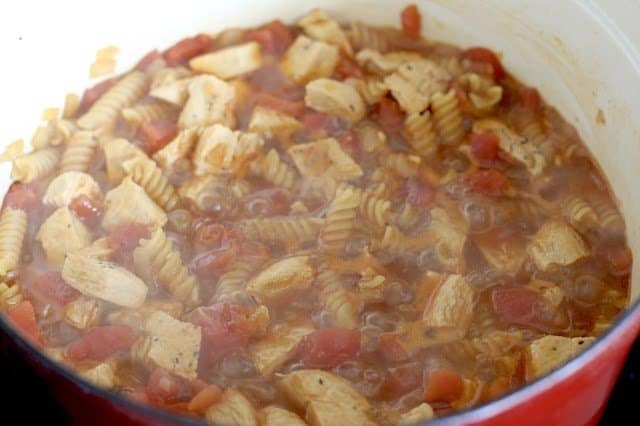 It takes less than 30 minutes to make and it is all done in one pot! Holla! Y’all know I am all about not using a bunch of dishes if I don’t have to. I love one pot wonders like this. And really, it’s all about the barbecue sauce. I always gotta use my favorite Sweet Baby Ray’s. It’s one of those sauces I always keep in the pantry. We use it for nearly everything. It’s a staple for sure. 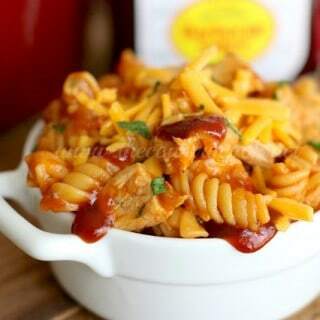 So when I was thinking about twists to the usual chicken pasta salads – I immediately thought “Shoot, I could throw some SBR (Sweet Baby Ray barbecue sauce) in there and that’ll really give it a punch of flavor.” So that’s just what I did! It was warm, filling and a whole meal in one. Plus, if you have any leftover, it reheats really well in the microwave. Just carry your bottle of SBR with you cause you’ll probably be wanting to squirt a bit more on there! 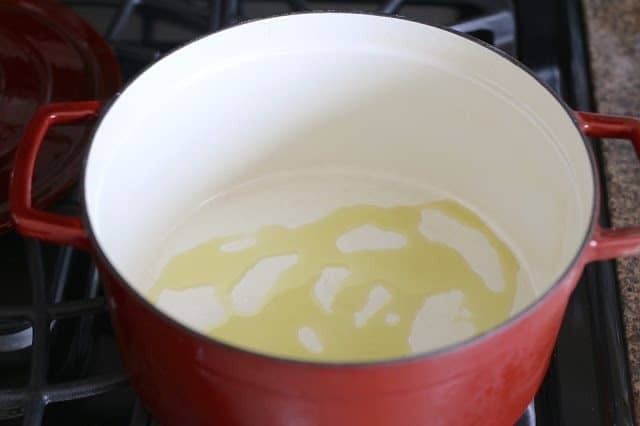 Heat a couple tablespoons of vegetable oil in a large pot or large skillet over medium-high heat. 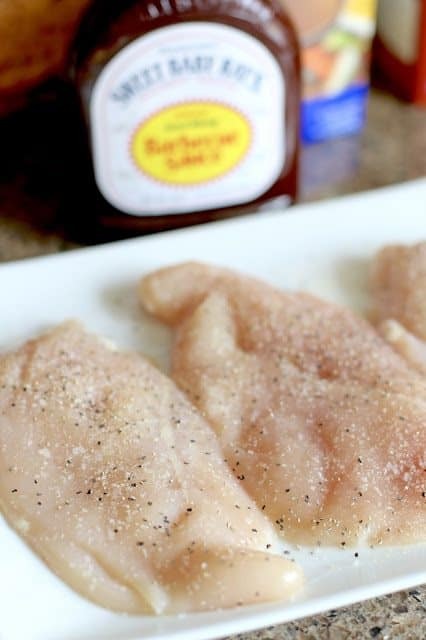 Season both sides of chicken breasts with salt, pepper and a little bit of garlic powder. 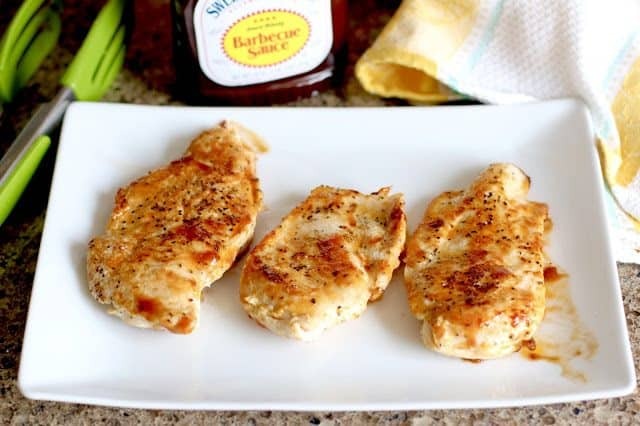 Place chicken breasts into pot and cook for about 3-4 minutes. Then flip over and cook an additional 3-4 minutes. Once you flip the chicken, spread about 2 tbsp. Sweet Baby Ray’s barbecue sauce onto each side. Cook for an additional two minutes. 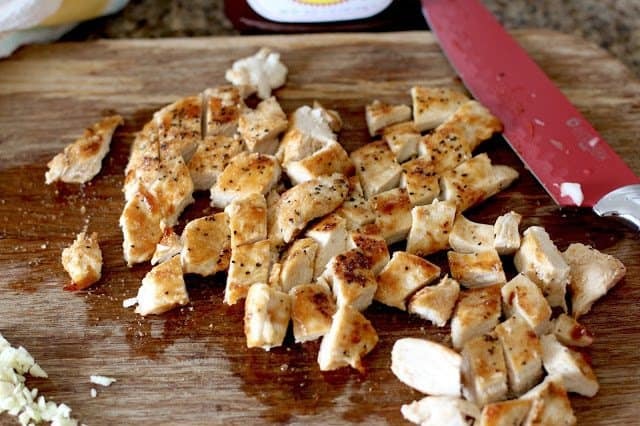 Take cooked chicken out of the pan and set aside. Add diced onions to the pot (you may need to add a bit more oil.) Season onions with a little salt & pepper. 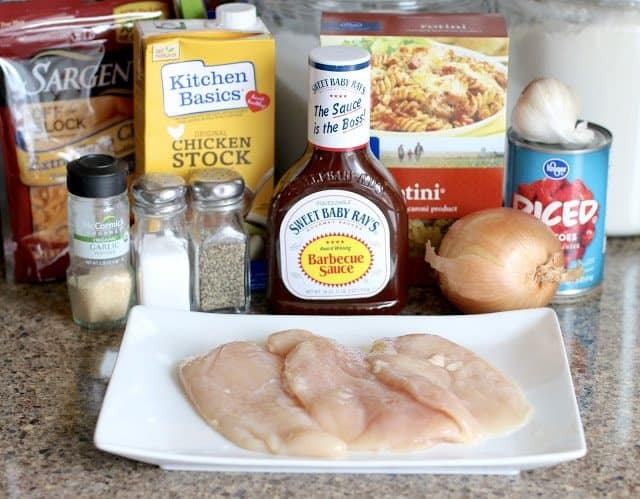 While the onions are cooking, chop up the chicken into 1-inch chunks. 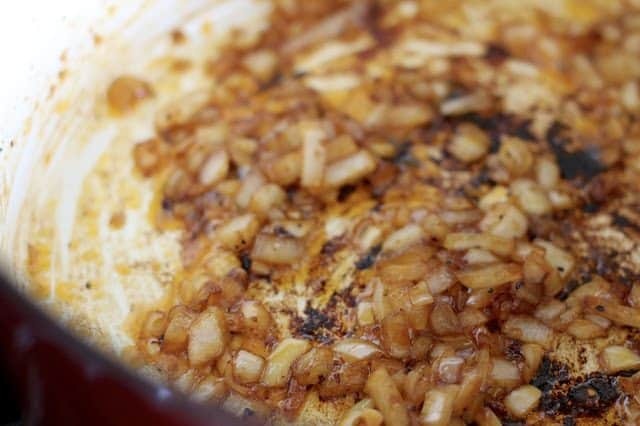 Stir garlic into the pot and cook for just a minute (you don’t want it to burn.) Then add in the can of undrained diced tomatoes and chicken stock. Stir in uncooked rotini pasta. And add the cooked chicken back in. Lastly, add in 1/4 cup (or more, depending on your preference) of SBR Sauce. 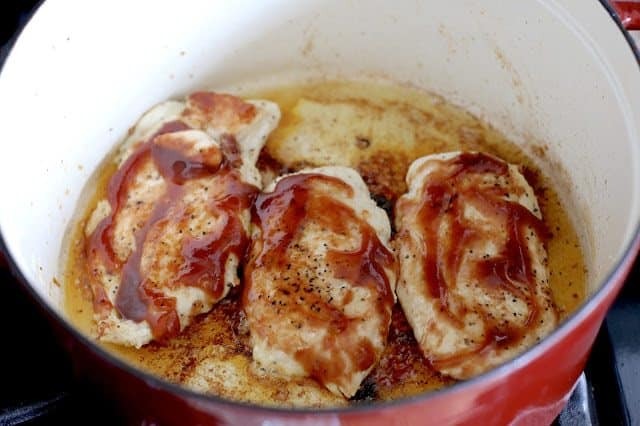 Place chicken breasts into pot and cook for about 3-4 minutes. Once you flip the chicken, spread about 2 tbsp. 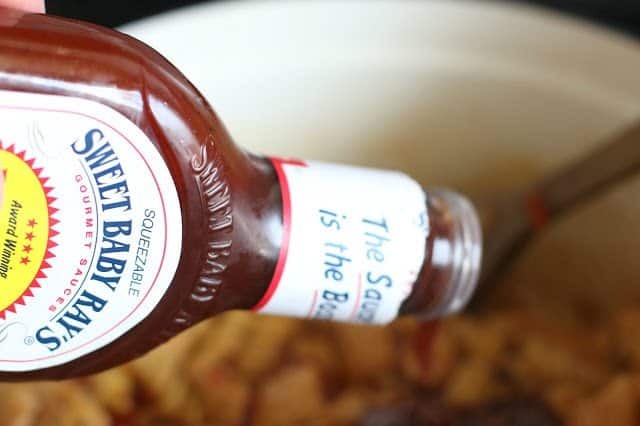 Sweet Baby Ray's barbecue sauce onto each side. Cook for an additional two minutes. Take cooked chicken out of the pan and set aside. 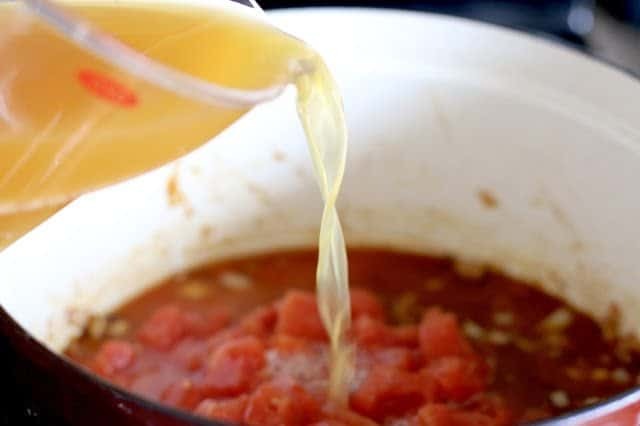 Then add in the can of undrained diced tomatoes and chicken stock. 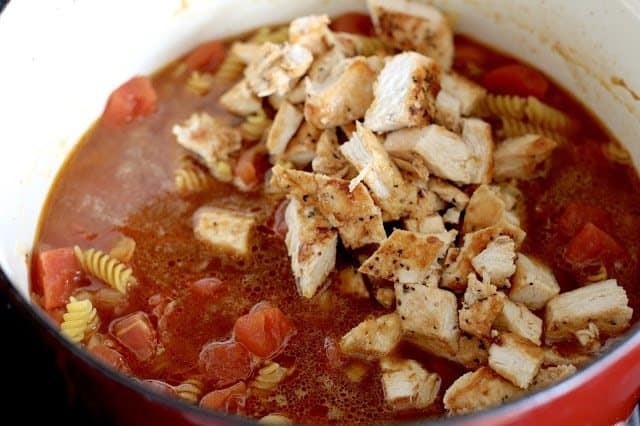 Stir in uncooked rotini pasta and diced chicken. Lastly, add in 1/4 cup (or more, depending on your preference) of SBR Sauce and top with shredded cheddar cheese. This is a sponsored post for Sweet Baby Ray’s. As always, all opinions are my own. I mean, who doesn’t love this stuff? Yum yum gotta try this and the other ones too. Our family lives BBQ chicken and SBR sauce on ji st about everything. .. thanks didn't think of this one did do Pizza and pockets too. That looks so good! 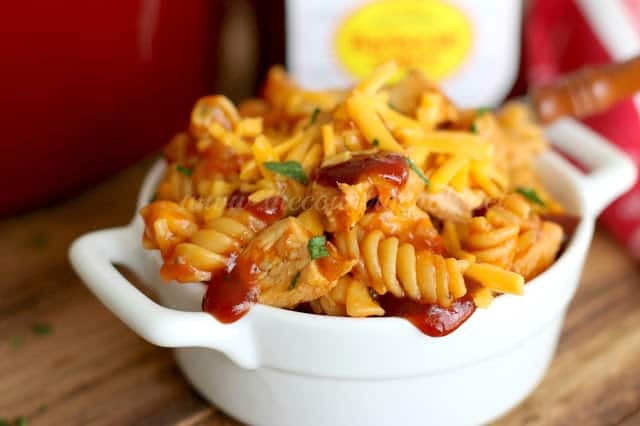 We love BBQ chicken and of course I love only having one pot to clean! Thanks ladies! 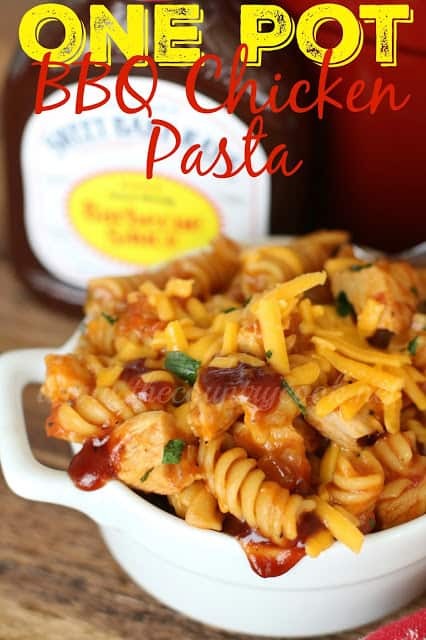 We loved this and will be adding it into our meal rotation! It's a keeper! 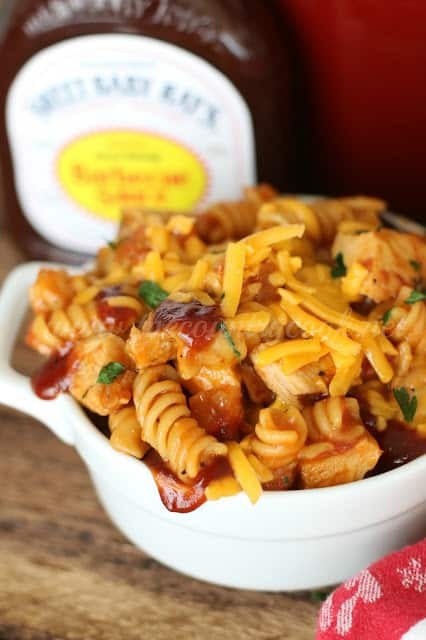 Sweet Baby Rays is my favorite BBQ sauce, so I was really glad to see this recipe posted on FB. On the menu for Monday. You have a great page, have many of your recipes. Thanks for posting. Thanks Joanne- Sweet Baby Rays is well loved around here. I hope you love this one as much as we do. You will have to come back and let me know how it turns out for you. This was so good! My husband, the chicken hater even loved it. l subbed Rotel mild with green chillies for the diced tomato, added a T of tomato paste because I started to worry the sauce wouldn’t thicken up, and used Webber BBQ sauce instead of SBR. Loved this…loved!!! What a great blend of flavors! I made this tonight for dinner and we all LOVED this. Excellent flavor, will definitely make again! I made a double batch because I had a feeling my son would like it…sure enough, my big strappin’ lad is on seconds! Thank you for this fantastic recipe, I found it on Pinterest. Bookmarking your blog for more! Made this last night for dinner. I thought it would be a lot like the goulash I make but oh my not at all . It was so flavorful and good! My husband said it was definitively a keeper. I made it just as you have written and wouldn’t change a thing. Can’t wait to have the leftovers for dinner tonight!